I’m in Medford, MA on an air mattress in my friend Tracy’s living room. It’s 7:30. Somehow, daylight has managed to find its way into the room through the sliding glass door, but before that through a looming and massive sheet of puffy, charcoal-grey clouds. It’s pouring outside. Today we’re addressing a question from reader CW that she left as a comment on a post about how to run a sub-3 marathon. CW asks a very common question: how to get back to her pre-baby race times. Can it be done? Absolutely. Two of our resident fast-as-F moms, Hops and Parsley, have been there and done that. Below, they share their top 3 tips for CW and anyone else in her situation. While the question is sub-3-specific, the advice can apply to any woman at any level looking to train seriously again after having babies. I am 32 years old now with two kids (seven months old and a three year old) and I really want to get back to racing. My last marathon was Boston Marathon 2013 and I ran it in 2:51. I ran that by running pretty much every day — maybe one day off every two weeks. I consistently did one long run a week of 18-22 miles with some at goal marathon pace and did at least one tempo run a week. I raced a 10k and half marathon in the training period to gauge fitness. I PR’d in the 10k with a 37:37 and half marathon with a 1:23. After having my first baby, I started running three days per week 6-ish miles at a slow pace for me. Then I got pregnant with my second kid (now 7 months old). Currently I am running three days a week about six miles per run. I really want to start training for another marathon but have no idea where to begin. Any ideas or training plans? I’d love to be fast again. Shalane warming up at the 2016 Olympic Trials. SaltyRunning.com photo. Get your long run in Saturday and make sure you’re in front of a television Sunday morning. The New York City Marathon is set to be an exciting one to watch. 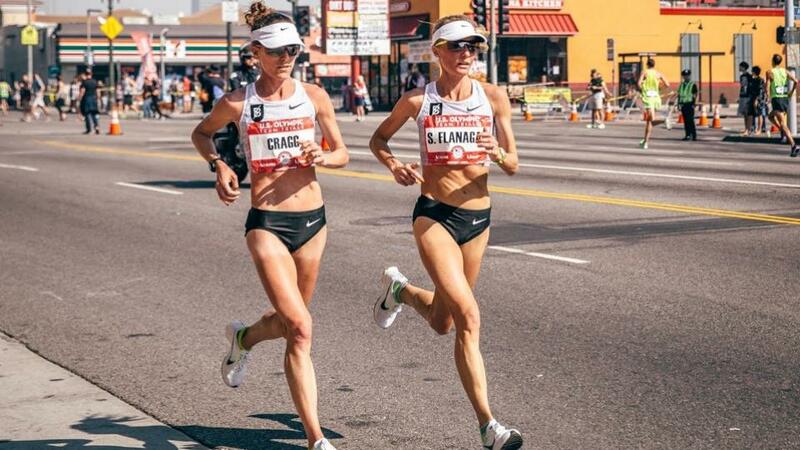 The American women are headed up by Shalane Flanagan, Kellyn Taylor, and Stephanie Bruce. That’s a hell of a line up. Shalane, who finished 6th at the Rio Olympics last year, withdrew from her hometown Boston Marathon this spring after fracturing a bone in her lower back training in the snow. She comes in without a lot of recent racing, having also opted out of the Peachtree 10k road race in July. But … she’s Shalane. Now 36, she seems to think she’s nearing the end of her marathon career. With a 2:21:14 PR — and an Olympic silver medal at 10,000 meters — Shalane is not one to count out. Kellyn and Stephanie train together with the NAZ Elite team and it looks like training has been solid. Kellyn has a 2:28:40 PR and Steph 2:29:35 — I’ll be curious to see if they pull a Shalane & Amy and run together, as they’ve been doing long runs and workouts together all year. Stephanie Bruce, left, and Kellyn Taylor training in Arizona. Kellyn had a great 2015 and 2016, with PRs from 10k to marathon. She fought hard for an Olympic berth, finishing sixth at the marathon trials and then a heartbreaking fourth in the 10,000 meter trials. Kellyn is gritty. Also she has a new adorable puppy and an adorable daughter and lots of pics of both on Instagram. Steph … well, everyone knows Steph, right? Mom of two, married to pro runner and NAZ Elite teammate Ben Bruce, Oiselle pro, Picky Bars co-founder. Steph PR’d in the 10k this year, breaking 32 minutes at the Stanford Invitational. She ran 2:29:35 at Houston back in 2011, but then was out of the marathon scene from 2014-2016 having those cute babies and busting up her abdominals. She won the Gasparilla Half in 1:12:52 in February, about 70 seconds ahead of Esther Atkins, and was fifth at the USATF 20km national championships in September. And watch for Aliphine Tullamuk, who has a 2:34:44 PR. This year, she’s won four national titles: cross country, 25K, 10K, and 7 miles. Aliphine is Kenyan-born and became a U.S. citizen in 2016; this will be her third marathon but first as an American. She finished as the top American at the 10-kilometer IAAF World Cross Country Championships in March, placing 15th in 33:43. Alexandra Cadicamo, 2:43:40 PR, was the 26th female at NYC back in 2013 in her debut. Runs for NYAC. Marisa Cummings, debut marathon with a 1:18:39 half-marathon PR set in 2014. Runs for NYAC. Allie Kieffer, 2:55:30 PR, ran a 1:14:13 half in September. Heather Lieberg, 2:34:09 PR, classroom teacher, mom, sixth at Gasparilla Half in 1:15:40 in February. Amanda Marino, 2:41:22 PR, 9th at RnR Philly in September in 1:17:57. Kate Pallardy, 2:40:15 PR, vegan, homeschools her two kids. Caroline Williams, debut marathon. Sixth at the Brooklyn Half in May in 1:16:36; runs for NYAC. All eyes will be on Meb Keflezighi as he runs the last marathon of his professional career. Meb won the NYC Marathon in 2009, the first American to do so since 1982. He won Boston in 2014, and at 41 years old, was 16th at the Rio Olympics. Meb has a marathon PR of 2:08:37 and ran a 63:30 half in February. Plus, Tanner Fruit’s marathon debut; Jorge Maravilla, Brendan Martin, and Michael Wardian (who will probably have raced a marathon on Saturday, too). This might be the easiest ever: Turn on ESPN. For real. Coverage from 9 a.m. to 12:30 p.m. Elite women start at 9:20 and Wave 1 plus elite men at 9:50. EVEN MORE pre-race coverage on ESPN3 online from 7-9 a.m.
Oh, you’re in NYC? Check out the official spectator guide here or click here for a local’s marathon-course dining guide. All entrants mentioned in the professional/elite fields are from the official media guide. I love marathon weekend in my adopted hometown of Eugene, Oregon. As you all know, Eugene is America’s running town, affectionately called Tracktown, USA. It’s the home of the late great Prefontaine, Hayward Field, and more elite runners that you can count. So You Want to Run a Canadian Marathon, eh? Happy Canada Day Eve, Saltines, and Happy early 149th birthday, Canada! As Canada’s southern neighbours, some of you may have considered running a marathon in the True North. As the Canadian voice of Salty Running, I wanted to commemorate Canada’s birthday by counting down six of the most eh-mazing 42.2 kilometre races. A Mari Usque Ad Mare (Canada’s national motto, “from sea to sea”), these races will give you a taste of different landscapes to be discovered in the second largest country in the world. It’s been a long time coming, but I finally slayed the marathon mental beast. Before we get to that, let’s back up a little bit. After my NYC Marathon debacle in the fall, I decided I needed to reevaluate and come up with a plan for actually making progress toward my 3:10 goal. First, I enlisted the help of my running dad, Lonn, and asked him to coach me. Second, I decided to avoid long-distance travel for races to avoid the motion sickness that plagued me in New York. And third, I vowed to battle my own mind and improve my shaky mental toughness. I chose a race in Newport, Oregon for its beautiful course and proximity to home. I also chose it because it is the marathon where my mental demon was born back in 2011, when I dropped out at mile 13. No matter the pace, racing a marathon means those final miles are tough! My coach is fond of saying that I have only raced a few marathons. What, you may ask, was I doing the other 20-some times I toed the marathon line? According to Coach I was just running. Is there really a difference between running and racing a marathon? I think so. I know countless great runners who do not race their marathons; they run a few marathons year after year always finishing in the same 10 minute range, and I wonder what they could do if they were just willing to put it all on the line. Now there is absolutely nothing wrong with simply running your marathons without racing, but any way you slice it, you still have to cover 26.2 miles! Crossing the finish line is a big deal in itself! It’s not for everybody but if you suspect you’ve never really raced a marathon, I encourage you to consider taking the leap. You might be surprised by what you’re capable of!